The Rs 6,000-per annum cash dole out to each farmer family in basic income support will help swing votes for the ruling BJP, but issues like the stray cattle menace in the electorally crucial Uttar Pradesh are a concern, says a brokerage report. The Swiss brokerage UBS in a report Tuesday also said unlike the past election, this election has no Modi-wave or any wave at all and that its field visits did not give enough fodder for it believe that the BJP will return to power after the summer hustings. The report also said Prime Minister Narendra Modi's high approval rating is possibly because of the low ratings of the other contenders. Basic income for small and marginal farmers--which the main opposition dubbed as an affront on the farmers' dignity as it's worth Rs 16a day, is a key decision and the voters will distinguish it from the usual pre-poll doles if implemented well, UBS said in the report prepared after a field trip and meetings. The budget sought to placate rural voters with this scheme retrospectively from December 2018 creating a Rs 20,000 crore additional hole in the already porous budgetary numbers. For the full fiscal next year it will leave a bigger hole of Rs 1.75 lakh crore on Central finances. The report said the government is "quite serious" about quickly rolling out the scheme and added the first tranche of the payouts could happen as early as the first week of March in UP, which got the party as many as 73 MPs from a total of 80 parliamentarians in the outgoing Lok Sabha. Usually, the voters look through pre-poll announcements, but the basic income scheme announced in the budget can turn out to be different, the brokerage claimed. However, the issue of stray cattle destroying farm lands in UP leading to law and order issues, which has been peculiar about cow protection, is an important issue in rural parts of the state, it said. While Opposition leaders admit the cash-dole will help drive away anti-incumbency sentiment, the ruling party leadership is confident that steps taken to address the issue will assuage the voters, it said. Unlike the 2014 elections, the forthcoming polls will be a "wave-less" election, where local issues become more prominent, the brokerage said quoting experts. 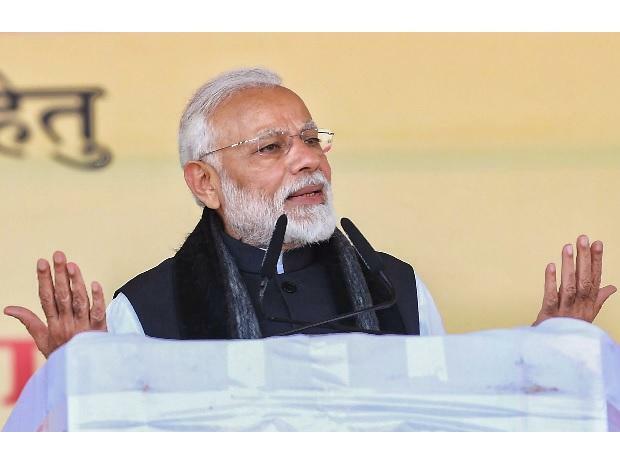 Prime Minister Narendra Modi's popularity is very strong even as expectations about the BJP's final tally are going down among the people it met, the brokerage said. "Modi's approval rating as a Prime Ministerial candidate remains high, possibly because of the low ratings of the other contenders," it said. Interestingly, the brokerage said the expectations on BJP's seat tally receded as the trip progressed for the investors accompanying on the trip. From an initial 220, it came down to 200 and even 180 for some, it said, without giving a view of its own. The Opposition's campaign will rest on lack of jobs, rural distress, demonetisation and weakening of national institutions under Modi, while government will stress on the social impacts of its schemes around cleanliness, hygiene, rural electrification, housing, getting an insolvency law etc.